Being a caregiver for a senior loved one can be challenging. When it’s possible, family caregivers should look for smart ways to accomplish their everyday tasks. Here are a few life hacks that can make a caregiver’s life a little bit easier. Caregivers can’t afford to waste any time, and making multiple trips to the car to fetch groceries, laundry, and medication can take a toll. To minimize the need for multiple trips, invest in a carabiner. These handy devices can be used to connect grocery bag handles, which makes carrying in multiple bags much easier. Consider hiring a professional caregiver who can take on some of your daily caregiving duties. Rhode Island at-home care experts are available to provide high-quality care to seniors on an as-needed basis. From assistance with mobility and exercise to providing transportation to the doctor’s office and social events, there are a variety of ways professional caregivers can help your aging loved one continue to live independently. If the whole family wants an update on your loved one’s condition, you may not have time to bring each family member up to date. Instead, keep track of your loved one’s condition using Google Docs. This level of organization can give the whole family access to important information, ranging from new medications to doctor’s appointments. 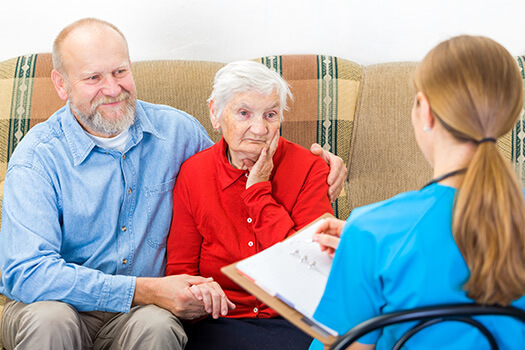 If your elderly loved one is living with a serious medical condition and needs help managing the tasks of daily living, reach out to Home Care Assistance, a Rhode Island home care agency you can trust. Our caregivers are available 24/7, there are no hidden fees in our contracts, and we offer a 100% satisfaction guarantee on all of our in-home care services. In case your loved one needs emergency assistance, you need to have his or her medical information on hand, including phone numbers, medications, doctors, and anything else an emergency technician might need to know to provide appropriate care. Make sure you have a copy of this information stored in multiple locations: the house, the car, your loved one’s purse or wallet, etc. You should also have a copy on your phone, stored so it’s easily accessible. Oftentimes, caregivers need to keep track of their loved one’s schedule. While online calendars can be efficient, wall calendars are a great scheduling tool as well. You can write down important dates on an oversized wall calendar, like upcoming medical tests and when to start new medications. This way, when family members or respite caregivers come over to assist, they’ll never have to search for scheduling information. Even a routine doctor’s appointment can take hours, so it’s important to have an everyday bag packed with essentials like wet wipes, tissues, important documents, and an mp3 player. You should also have an overnight bag ready to go in case of emergency situations. This bag should contain things like fresh clothing, slippers, snacks, and some entertainment. Caregivers often spend a lot of time at the grocery store. Many have to make trips for their loved one and for themselves. Instead of making multiple grocery runs, purchase food for your loved one’s household and for your own household at the same time. To ensure the food doesn’t spoil in the car, purchase an insulated cooler to keep things like milk and meat safe. You might also benefit from online shopping. Many local grocery chains offer delivery services, which allow caregivers to skip going to the grocery store altogether. Caring for a senior loved one can be rewarding, but it can also be overwhelming for family caregivers who have other responsibilities they need to focus on. For these families, the perfect solution is respite care. Rhode Island families rely on our caregivers whenever they need time to rest, work, run errands, and even go on vacation. To learn about our high-quality senior care plans, give Home Care Assistance a call at (401) 284-0979 today.